Stickleback species pair from Paxton Lake, British Columbia. Gravid benthic top, gravid limnetic bottom. National Recovery Team for Stickleback Species Pairs. 2007. Recovery Strategy for Paxton Lake, Enos Lake, and Vananda Creek Stickleback Species Pairs (Gasterosteus spp.) in Canada. Species at Risk Act Recovery Strategy Series, Fisheries and Oceans Canada, Ottawa. v + 31 pp. Common Name: Threespine stickleback, species pairs denoted as “limnetic” and “benthic” species. Enos Lake species pair. These fish are restricted to a single, small lake on Vancouver Island are experiencing severe decline in numbers due to deteriorating habitat quality and the introduction of exotics. Since the COSEWIC designation, the species pair has collapsed into a hybrid swarm. A captive breeding program is ongoing with pure limnetics and benthics. Paxton Lake species pair. This unique Canadian endemic is impacted by habitat loss and/or degradation from human disturbance. It is in danger of extinction by the introduction of exotic species. Vananda Creek species pair. This unique Canadian endemic is impacted by habitat loss and/or degradation from human disturbance. It is in danger of extinction by the introduction of exotic species. Canadian Occurrence: Stickleback species pairs are restricted to specific coastal lakes in the Georgia Basin, British Columbia. Present occurrence is four lakes (in two watersheds) on northern Texada Island. Historically, species pairs also existed in Hadley Lake, Lasqueti Island, and in Enos Lake, Vancouver Island. The species pair in Hadley Lake went extinct following introduction of brown bullhead, and the species pair in Enos Lake has been reduced to a hybrid swarm following introduction of signal crayfish. Enos Lake species pair. Original designation (including both Benthic and Limnetic species) was Threatened in April 1988. Split into two species when re-examined. Designated Endangered in November 2002. Last assessment based on an update status report. Hadley Lake species pair. Designated Extinct in April 1999. Status confirmed in May 2000. Last assessment based on an existing status report. Paxton Lake species pair. Designated Threatened in April 1998. Status re-examined and confirmed in April 1999. Status re-examined and uplisted to Endangered in May 2000. Last assessment based on an existing status report. Vananda Creek species pair. Designated Threatened in April 1999. Status re-examined and uplisted to Endangered in May 2000. Last assessment based on an existing status report. 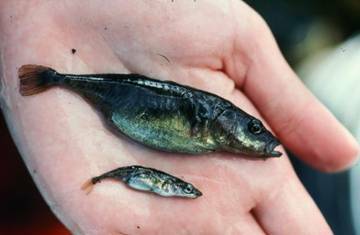 The fish known collectively as “stickleback species pairs” are small, freshwater fish descended from the marine threespine stickleback (Gasterosteus aculeatus). In each case, one of the species (referred to as "limnetic") primarily exploits plankton, and has morphological traits such as a fusiform body, narrow mouth and many, long gill rakers. These traits are considered adaptations to a zooplankton-consuming lifestyle. The other species (referred to as "benthic") mainly eats benthic invertebrates in the littoral zone, and has a robust body form, wide gape and few, short gill rakers, traits considered to be advantageous in benthic feeding. The pattern of morphological and ecological divergence is similar in each of the lakes, such that limnetics all look alike, as do all benthics. Despite similar appearance, phylogenies based on molecular genetics strongly indicate that the pairs are independently derived. Thus, benthics from different lakes should be considered separate species, and the same for limnetics. There are thus at least eight separate species within the species pair complex—two in each of the four watersheds. Stickleback species pairs were known to exist in four watersheds in the Georgia Basin, British Columbia: two watersheds on Texada Island, and one each on Lasqueti Island and Vancouver Island. Evidence indicates that the species pairs evolved independently in each watershed, meaning that this is a multi-species complex rather than two species spread over multiple watersheds. Within the last decade the species pair on Lasqueti Island has been declared extinct, and the species pair in Enos Lake has collapsed into a single hybrid swarm. The present global range is therefore restricted to two watersheds on northern Texada Island – the Paxton Lake watershed, and the Vananda Creek watershed (with three lakes, Balkwill, Priest and Emily). Knowledge of habitat requirements comes mainly from observations in Paxton and Enos lakes, and is assumed to be representative of other species pairs. In general, stickleback species pairs spawn in littoral areas in the spring, rear in littoral and pelagic areas in spring and summer, and overwinter in deep water habitats during the fall and winter. The stickleback species pairs appear to have endured in the presence of only one other fish species, coastal cutthroat trout (Oncorhynchus clarkii clarkii). Maintaining a simple ecological community is necessary if the species pairs are to be retained, as underscored by the rapid extinction of the Hadley Lake species pair following introduction of brown bullhead (Ameiurus nebulosus). Bell, M.A., and S.A. Foster. 1994. editors. The evolutionary biology of the threespine stickleback. Oxford University Press, Oxford, UK. Bentzen, P., and J.D. McPhail. 1984. Ecology and evolution of sympatric sticklebacks (Gasterosteus): specialization for alternative trophic niches in the Enos Lake species pair. Canadian Journal of Zoology 62:2280-2286. Boughman, J.W. 2001. Divergent sexual selection enhances reproductive isolation in sticklebacks. Nature 411: 944-947. Hatfield, T. 2001a. Status of the stickleback species pair, Gasterosteus spp., in Hadley Lake, Lasqueti Island, British Columbia. Canadian Field-Naturalist 115:579-583. Hatfield, T. 2001b. Status of the stickleback species pair, Gasterosteus spp., in the Vananda Creek watershed of Texada Island, British Columbia. Canadian Field-Naturalist 115:584-590. Hatfield, T. and D. Schluter. 1996. A test for sexual selection on hybrids of two sympatric sticklebacks. Evolution 50: 2429-2434. Hatfield, T., and J. Ptolemy. 2001. Status of the stickleback species pair, Gasterosteus spp., in Paxton Lake, Texada Island, British Columbia. Canadian Field-Naturalist 115:591-596. Kraak, S.B.M., B. Mundwiler, and P.J.B. Hart. 2001. Increased number of hybrids between benthic and limnetic three-spined sticklebacks in Enos Lake, Canada; the collapse of a species pair? Journal of Fish Biology 58:1458-1464. McPhail, J.D. 1989. Status of the Enos Lake stickleback species pair, Gasterosteus spp. Canadian Field-Naturalist 103:216-219. McPhail, J.D. 1993. Ecology and evolution of sympatric sticklebacks (Gasterosteus): origin of the species pairs. Canadian Journal of Zoology 71:515-523. McPhail, J.D. 1994. Speciation and the evolution of reproductive isolation in the sticklebacks (Gasterosteus) of southwestern British Columbia. Pages 399-437 in M. A. Bell and S. A. Foster, editors. The evolutionary biology of the threespine stickleback. Oxford University Press, Oxford, UK. McPhail, J.D. 1984. Ecology and evolution of sympatric sticklebacks (Gasterosteus): morphological and genetic evidence for a species pair in Enos Lake, British Columbia. Canadian Journal of Zoology 62: 1402-1408. McPhail, J.D. 1992. Ecology and evolution of sympatric sticklebacks (Gasterosteus): evidence for a species-pair in Paxton Lake, Texada Island, British Columbia. Canadian Journal of Zoology 70: 361-369. Nagel, L. and D. Schluter. 1998. Body size, natural selection, and speciation in sticklebacks. Evolution 52: 209-218. Schluter, D. 1994. Experimental evidence that competition promotes divergence in adaptive radiation. Science 266: 798-801. Schluter, D. 1995. Adaptive radiation in sticklebacks: trade-offs in feeding performance and growth. Ecology 76: 82-90. Schluter, D. 2003. Frequency dependent natural selection during character displacement in sticklebacks. Evolution 57: 1142–1150. Schluter, D. and J.D. McPhail. 1993. Character displacement and replicate adaptive radiation. Trends in Ecology and Evolution 8: 197-200. Schluter, D., and J.D. McPhail. 1992. Ecological character displacement and speciation in sticklebacks. The American Naturalist 140:85-108. Taylor, E.B. and J.D. McPhail. 2000. Historical contingency and ecological determinism interact to prime speciation in sticklebacks, Gasterosteus. Proceedings of the Royal Society of London, Series B 267: 2375-2384. Taylor, E.B., and J.D. McPhail. 1999. Evolutionary history of an adaptive radiation in species pairs of threespine sticklebacks (Gasterosteus): insights from mitochondrial DNA. Biological Journal of the Linnean Society 66:271-291. Vamosi, S.M. 2003. The presence of other fish species affects speciation in threespine sticklebacks. Evolutionary Ecology Research 5: 717–730. Vamosi, S.M., T. Hatfield, and D. Schluter. 2000. A test of ecological selection against young-of-the-year hybrids of sympatric sticklebacks. Journal of Fish Biology 57: 109-121. Wood, P., J. Oosenbrug, and S. Young. 2003. Vananda Creek Stickleback Species Pair Managing Identified Wildlife Account (draft).